1 Peel the red onions and cut into rings. 2 Heat oil in a non-stick pan (about 20 cm/approximately 8 inches in diameter). Fry onion rings over low heat for 8 minutes, turning frequently. 3 Whisk eggs and mineral water. Season with salt, pepper and freshly grated nutmeg. 4 Pour egg mixture over the onion rings and let thicken over low heat for 10-12 minutes. 5 Meanwhile, lightly toast the red pepper flakes in another non-stick pan. Add oats and amaranth and cook over medium heat. Stir in honey and 1 pinch of salt. Transfer to a plate. 6 Cut nori seaweed with kitchen shears into short, thin strips. 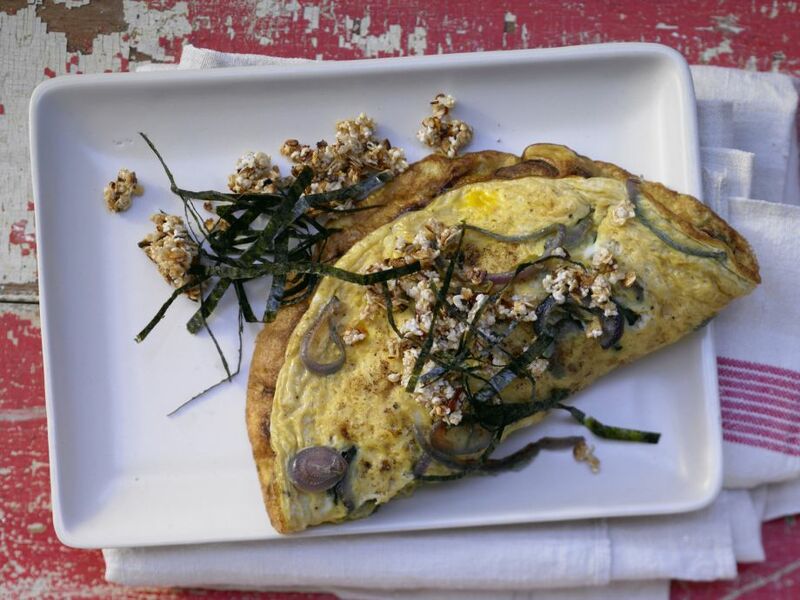 Arrange the onion omelet on a plate with the spicy oat crumble and the seaweed strips.